I can’t believe we’ve been back from New Orleans for almost a month and I am only just now getting around to telling you about it! I know – shame on me. But I’ve just been too excited about the Sustainable Seafood Blog Conference – and telling you about that conference has BASICALLY been just like telling you about our trip to New Orleans, right? I’d like to think so. Anywho, it’s about time I shared a few pictures from our trip to NOLA. Kyle and I went to New Orleans (our first time there!) in July for a mini-vacation coupled with a bunch of meetings and planning for the Sustainable Seafood Blog Conference in June 2015. 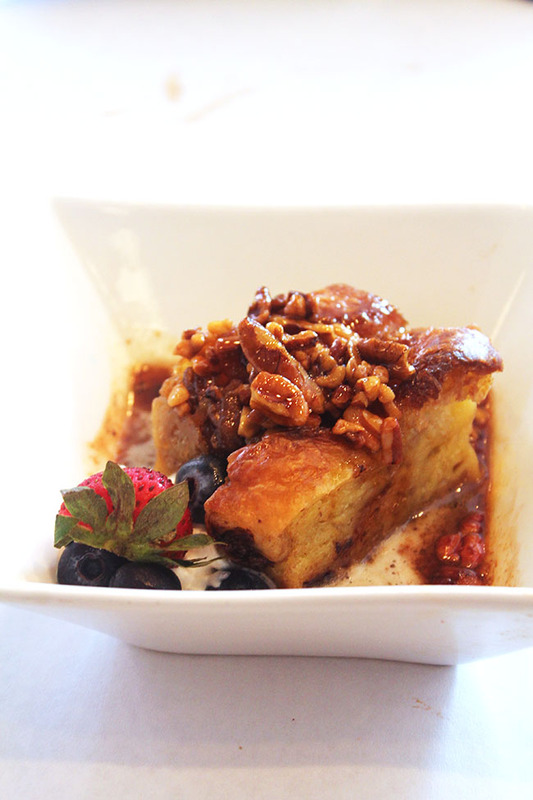 We scouted hotels, ate ALL OF THE FOOD, and toured a few venues that will be a major part of #SSBC15! (See that? We already have a hashtag. SO OFFICIAL). Above is a quick photo I took of the St. Paul Cathedral in the French Quarter (also known as the exact same picture taken by pretty much every tourist in the history of ever, but whatevs). 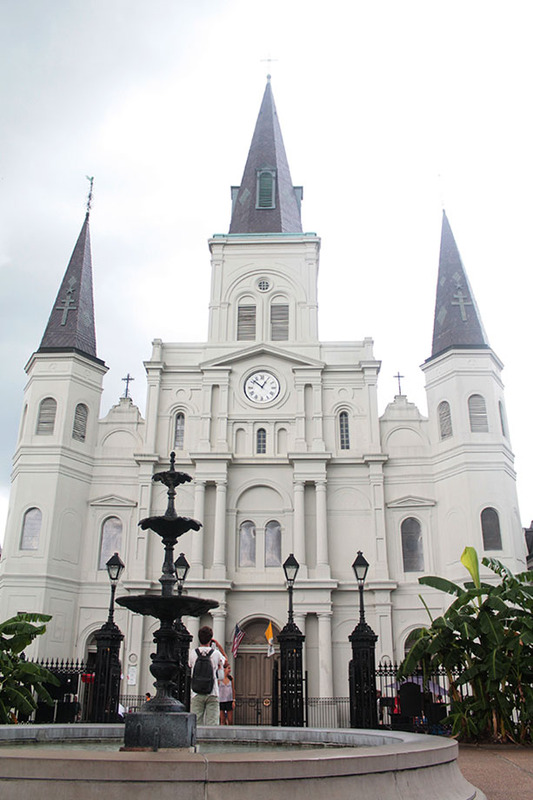 The cathedral and the beautiful park in front of it are only a couple of blocks from the hotel we’ll be staying at for #SSBC15 – and it’s right across the street from Café du Monde (AKA beignet heaven). 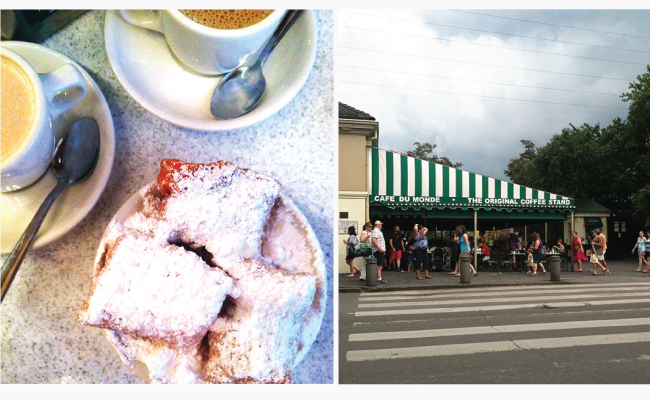 We ate SO MUCH while we were in New Orleans – and even though we were completely stuffed for the whole trip, we both wished we could have spent a few more days in the city to explore and eat even more of the food. Good thing we’re going back next June, right? Some of the highlights were the recent James Beard Award-Winner Pêche, who took home the awards for Best New Restaurant AND Best Chef: South. We stopped by for lunch at the bar and snacked our way through a good portion of the menu – everything was great, but the Shrimp and Fontina Croquettes we had were definitely the standout for me. They were served with pickled okra and were completely wonderful. We had a great bartender who was happy to make recommendations and let us order one or two things at a time – my favorite way to eat! 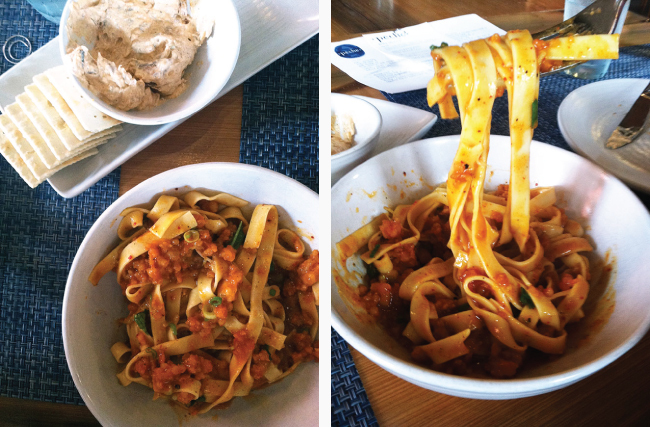 We ordered one of his favorite dishes – a spicy noodle bowl with ground shrimp (pictured below) – as well as some smoked tuna dip (also pictured below) and a GIANT slice of salted caramel cake. 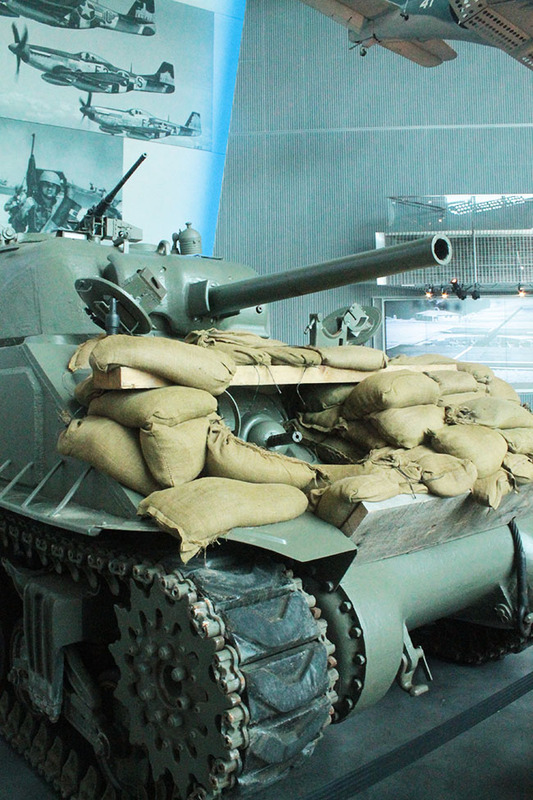 One of our free days was spent going through the National World War II museum – I had no idea that it was in New Orleans, actually, but I’m glad it was, because it was a really impressive stop. We spent a good 5 hours going through the museum, and when we finished going through the exhibits, we headed over to John Besh’s American Sector Restaurant for happy hour. We had a few assorted snacks and some seriously amazing jalapeño cheddar grits (which I still have dreams about – I think I may have to recreate them soon!). Apparently, we hit American Sector at just the right time – it’s apparently closing for some renovations and won’t be a John Besh restaurant anymore when it reopens! Hopefully the new management can get their hands on a copy of the recipe for those grits, though – I was kind of in love with them. Other food highlights included charbroiled oysters at Acme Oyster House (so good that we went back for more the next day!). There was a line out the door almost every time we walked by this place, but since you can have open alcohol in public in NOLA (WHAT? CRAZY! I love it) you can send someone to grab drinks while another person saves your spot in line, and alcohol of course helps the time pass a little quicker. No outside drinks allowed in the restaurant, though, so be prepared to chug the rest of that beer if your name comes up to be seated! The line can look a bit intimidating, but it is TOTALLY worth it for some of their charbroiled oyster goodness. Hands-down one of my favorite things we ate on the whole trip. We also became big fans of the Sazerac, a classic New Orleans cocktail. 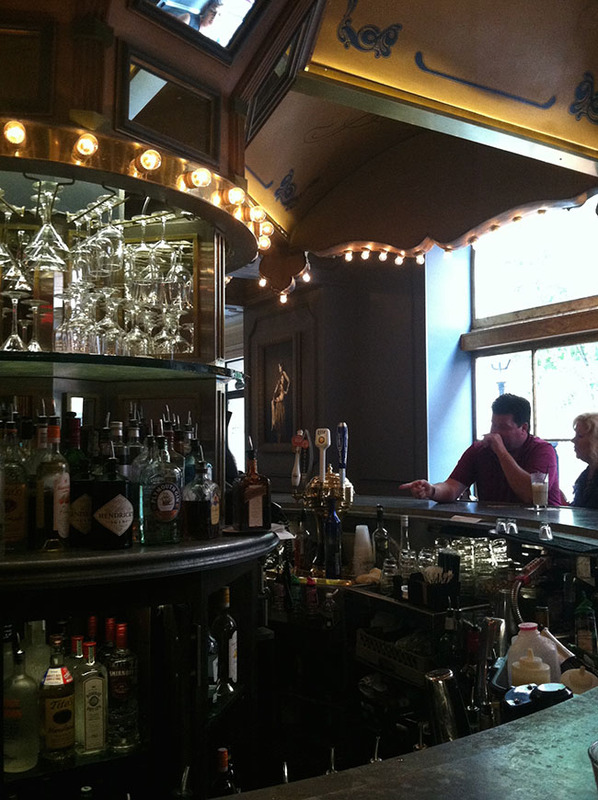 We had great ones at the Maison Dupuy, the Sazerac Bar (the best Sazerac of the trip – not surprising, considering their name), and the famous Carousel Bar at Hotel Monteleone. We finished the trip off with the famous Muffaletta sandwich at Central Grocery in the French Quarter. 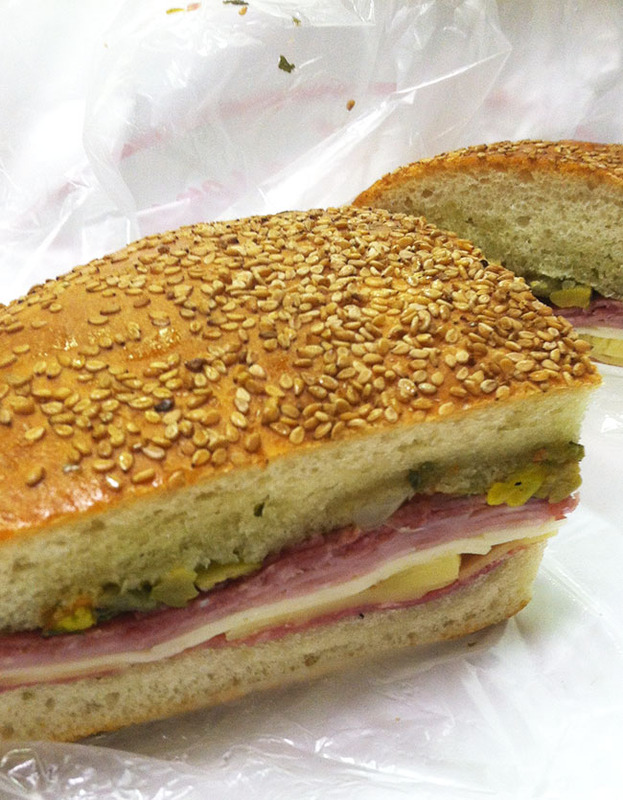 To be honest, we didn’t quite get what the big deal was about the Muffaletta (GASP! BLASPHEMY!) – it was a perfectly tasty sandwich, but I think we were expecting something different after how much everyone had been hyping it up. They’re GIANT, so a half-sandwich was more than enough food for Kyle and I, and they’re all pre-made so the line moves fairly quickly. Be warned – there’s very little seating since this actually a small grocery store, but if one person lurks around the tables in back to snag seats while someone else orders the sandwich, you’ll have it covered. In between all the eating we did, we squeezed in a lot of walking and exploring. We loved how walkable the whole city was – it was so easy to wander around and find fun things to do! Overall, it was an amazing trip, and I can’t WAIT to go back next year for The Sustainable Seafood Blog Conference! Want to come with me (I hope you do)? Sign up for email updates here – Early Bird Tickets go on sale October 15th! I love this recap of NOLA! I love it there and can’t wait to go back. Those oysters stole my heart. I am obsessed with them. 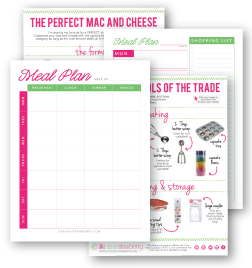 Trying to figure out how I can make them at home…I am thinking it involves quite a bit of butter and cheese. Anyway, so glad you had fun! Thanks, Jessica! If you figure out the oysters, let me know – we don’t have a grill, but I’m kind of thinking of dousing some with a ton of butter and parmesan and broiling them for a few minutes in the oven? 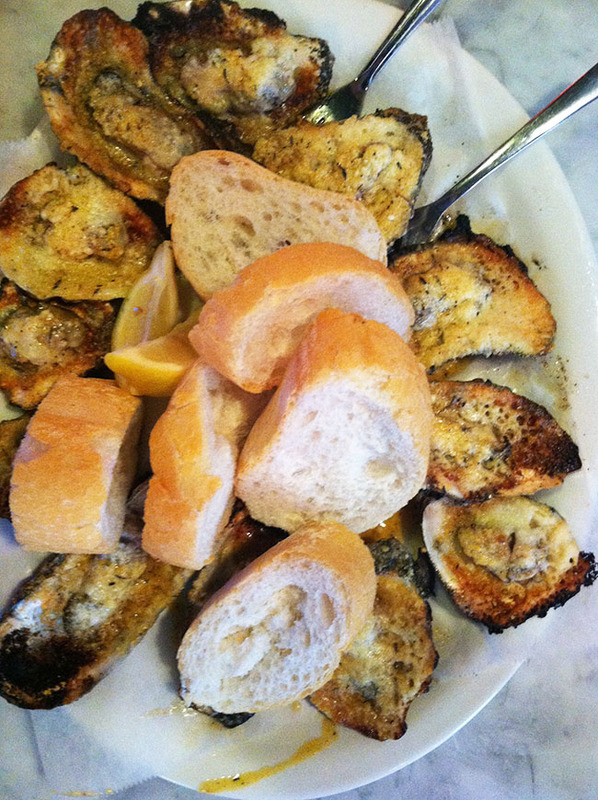 I loved them so much, I don’t think I can handle living 1000 miles away from all that charbroiled oyster-y goodness! Great recap of your trip and I love the news about SSBC15!! 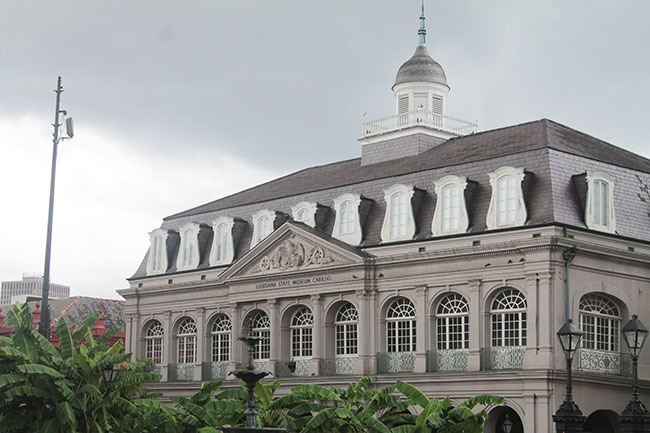 I think one of my favorite parts of New Orleans (besides the food of course) when I visited was also touring St. Louis Cathedral. It’s just so beautiful.